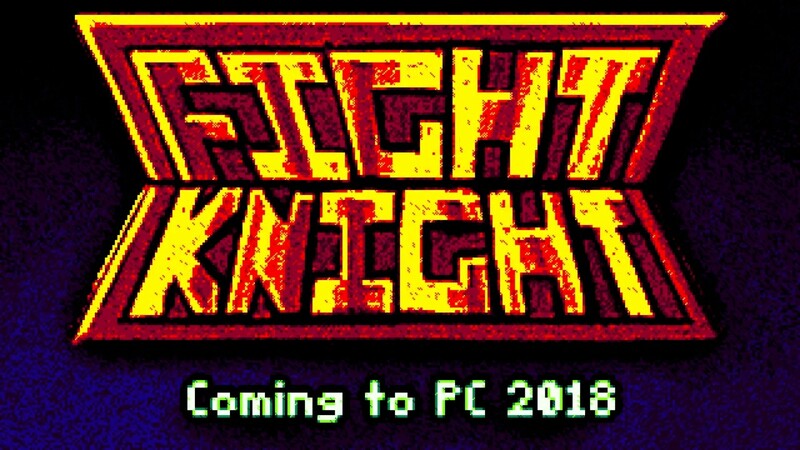 If you’ve been paying attention, you might have noticed a game called Fight Knight hitting Kickstarter earlier this month. With its colorful aesthetics, retro music, and fast-paced gameplay, Fight Knight turned more than a few heads and demolished its funding goal in no time at all. After trying the demo, I similarly fell in love with this punchy knight and his quest through a mysterious Tower. Recently, we at Video Game Choo Choo reached out to pick the brain of Fight Knight’s lead developer, Thomas LeBlanc – what follows is our interview. Ryan: So there’s obviously a lot to discuss in regards to Fight Knight, but it wouldn’t hurt to begin at the beginning. Do you mind telling us a little about yourself, and what Fight Knight is? Thomas LeBlanc: Hi! I’m Thomas LeBlanc, the lead developer on Fight Knight. I’ve been making games independently for about 5 years now. Fight Knight is a game I’m making with Zeke James, Tom Schley, and Tommy Trinh, and we started this project in earnest at the beginning of 2017. It’s basically a dungeon crawler with random encounters, except the encounters are a real-time Punch-Out! !-esque combat scenario where you can fight large groups of enemies at once. R: In the Kickstarter page, you mention Fight Knight originated from a character in Dark Souls, became a game idea in 2014, and then entered “serious development” at the beginning of this year. What’s it like seeing something you’ve been tinkering with for a good number of years come to fruition, especially when you’ve raised almost three times your Kickstarter in ten days? TL: It’s been entirely overwhelming. It’s really nice to know that something you’ve spent so much time on is actually valuable to others. That said, I’ve hardly had any time to relax and really soak it in, since we’re still very much hard at work on the game! R: On the Kickstarter, you’ve mentioned the extra funding won’t go to stretch goals, and instead will go towards making Fight Knight the best it can be. In that vein, I’d like to go ahead and talk about the game, or more specifically, the demo. This isn’t really a question, but I loved it. How long did the demo take to complete, and how did you decide what would be included? TL: Hey thanks, I’m glad you liked the demo! 😀 The demo is essentially everything presentable that we’ve made for the game so far. It worked out surprisingly well considering we were just building the beginning of the game, I think. We decided it’d just be best to show off as much good stuff as possible. I think it’s been a while since people have had a demo on their hands that actually had some substantial content. R: One of the first things I noticed about Fight Knight is the eye-popping color palette, with all the bright greens, oranges, purples, etc. Was there anything specific that inspired the game’s aesthetic and color choices? TL: I’m always drawn to oversaturation, haha. I’m a fan of pop art in general, and like, the limited colors that old cheap comic books would have. I think one specific inspiration was the work of Katsuya Terada for Nintendo on the Zelda series. Stark contrasting colors with no real explanation other than aesthetic clarity and appeal, and efficiency. Not only do I think limited colors can look great, they also mean it’s less to think about on the artist’s end, which is invaluable for a developer. Keeping the assets divorced from color information means we don’t have to think about colors until the final stage of polish. R: In terms of visuals, the enemy and character designs of Fight Knight are really fantastic too. Even the “common” fantasy mobs such as goblins and mummies feel familiar yet totally unique; like illustrations from a more stylized Dungeons & Dragons handbook. Were there any big inspirations when coming up with the types and styles of enemies and NPCs in the demo? TL: When we started the project, my idea for the art style was something that would try to be really detailed and realistic, to contrast against the silliness of the player. But fairly quickly that fell by the wayside as I realized that was a bit beyond my abilities artistically, and I settled into a more comfortably cartoony direction. I think in the end it was the better choice, as the large expressive characters are a lot of fun to fight. Classic dark DnD illustrations are still a big inspiration as you mentioned, but also stuff along the lines of the incredibly appealing enemy designs Akira Toriyama created for the likes of Chrono Trigger and Dragon Quest. R: There’s certainly a retro feel about the demo, not only in the visuals and music, but also in the zones themselves, and in the character movement. I’m not very familiar with classic fantasy games, but are there any you specifically had in mind when conceiving Fight Knight? TL: There’s a game on the Nintendo DS that I’m a huge fan of called The Dark Spire. Tile-based movement is certainly nothing new, but that game in particular is a big part of why I wanted to do the same for Fight Knight. There’s something about first person tile-based movement that’s very abstract and interesting to me. In full 3D movement, you’ve got all this smooth minute detail to your character motion as you would in reality, and that invites you to take in the world you’re exploring as a direct representation. But with tile-based movement, you’ve portioned the infinite detail of the real world into 1×1 meter boxes, and that brings a certain level of unreality with it. It encourages you to imagine more than what you’re seeing onscreen, in a sense. I’m not sure if that comes across in Fight Knight specifically, but that’s definitely the reason behind my affinity towards tile-based movement. R: Speaking of the music, Tom Schley/Silkersoft’s score is pretty great, but I think it speaks for itself. Since listening to music usually helps me with my creative process, here’s what I want to know: what kind of music does the creative force behind Fight Knight enjoy? R: The origins of Fight Knight strike a chord with me because, funnily enough, my roommate and I also embarked on a multi-year project after playing Dark Souls together – in our case, it was a radio show at our university. What is it about Dark Souls that brings people together? TL: Ha, that’s great! Dark Souls really was special. I mean of course, it’s just a really good game, but more than that it’s filled with secrets to discover and seemingly endless little things to keep the game fresh. The multiplayer component is also something completely unique (other than Demon’s Souls) and the way it so completely intersects with the singleplayer means it inherits the same depth and complexity. It’s a great generator of stories and information which you want to share. TL: We’ll definitely be looking into the Switch, among other platforms, after the Kickstarter is over! I don’t want to promise anything, because the game is built in Gamemaker: Studio, which means a lot of these things are more or less out of my hands. R: One last question: between the core combat and the flurry move called “Star-Eyed Special,” I’m assuming there’s at least a little bit of JoJo’s Bizarre Adventure involved in Fight Knight’s creation. Who’s the best JoJo, and what’s the best Stand? TL: Good catch 😛 I don’t think anyone can top Joseph for me (though Jolyne is close), but in terms of stands that’s a much harder choice. Maybe Crazy Diamond, I’m clearly a fan of diamond shaped helmets after all, haha. If you’re looking for more info on Fight Knight, or want to support the game, its Kickstarter is currently still active. In addition, the game’s free demo is available through itch.io. Fight Knight can be found on Twitter @Sorcerobe, and Thomas LeBlanc can be found @BOENSAW on Twitter or @thomasleblanc on Tumblr.